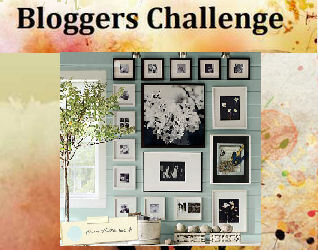 Happy Bloggers Challenge Friday, thanks for stopping by today! It was wonderful to see everyones take on the "bird theme" challenge, thanks to those who played along. This weeks Challenge is to use the photo below as your inspiration in creating your project. What you use for inspiration it totally up to you, it can be the colors in the photos, maybe the grouping of photos has inspired a layout or sketch. Maybe you picked one of the photos and when with a theme - as you can see the inspiration is endless and totally up to you. See the details below on how to play along. I took my inspiration from the colors in the photos (blue, white, brown, green), the matting of the photos and the floral image. Combine them all together and you come up with something like this, very CAS for me! This really should have been only a 10 minute card, BUT, I encountered a slight problem. My Big Shot bit the dust while I was cutting/embossing. GASP, right! In the last month the turning was a bit wonky, well tonight, it just decided it was going to stop turning all together. A girl can't live without her die cutting machine, so I guess I will be making a trip once the stores open! 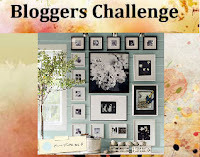 If you'd like to play along with this weeks Bloggers Challenge, please link back to this post on your blog and mention you created your card for the Bloggers Challenge Inspiration Challenge. Please add your link using the Link Tool below. Just a note on the link tool, your link should be a direct link to your Bloggers Challenge Post, use your name as the Title. Please do not link to cards that were created prior to the challenge date. Entries not linking properly will be removed. WOW! That is so gorgeous and elegant! You should enter it over at Joan's Garden! Very elegant and beautiful! 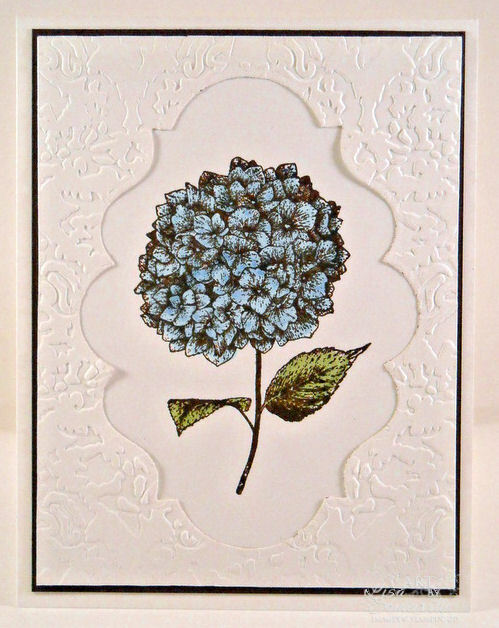 Love the hydrangea and the elegant frame in white just makes is pop! Yikes! No cutting machine... Now the hard part it to decide which one to replace it with! Lovely card, that new nestie is perfect for you. So sorry to hear your sad news....what was life before the Big Shot? Me oh my to spend or not to spend.....that is the question! Beautiful card. The white on white embossing background frame is so elegant with your flower. So sorry to hear about your Big Shot. I can feel your pain! WOW! Beautiful, elegant, and simple....outstanding. Sorry your Big Shot died....you are the first I've heard of that has worn one out. One last thing...that inspiration photo has chocolate, not black?!! Sure looked black to me. Your card on the other hand turned out beautiful. The embossing with the flower framed is gorgeous. I would call or e-mail Sizzix and let them know, before you run out and buy. I have heard of some people having them replaced by Sizzix. When I bought mine, I did so on Amazon and it was a really good price. 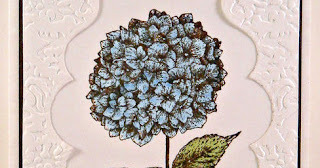 Love how you framed the hydrangea, which is so beautifully colored. Good luck with the BS! This is gorgeous! What a beautiful card. White and blue are one of my favorite combos and this flower is just stunning. Love the background and cut out window. Stunning card Lisa. The flower is so pretty and just looks amazing in the frame you created. Simplistic and yes designed with such elegance...love that stamp and the embossed front. What a beauty Lisa. The colors are very pretty together- the white on whote is wonderful! So pretty! 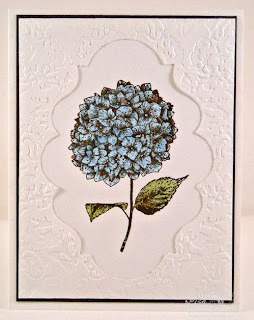 Love the embossed panel with the cut out for the flower. So sad about your Big Shot! This card is gorgeous!! Your BS made a great sacrifice to make this card possible! EEK! I'd be lost without my big shot!! I feel your pain! Beautiful and elegant. I love the double embossed window and flower. Lisa this is gorgeous, love the soft blue of the flower with the all white frame. Awesome! The brown and blue look gorgeous together in this flower. Stunning card. Your card is gorgeous, I forget to use a die cut in the middle of my card like that so thanks for the reminder!! What a beautiful card. That hydrangea bush is lovely and the coloring is so nice. this was a fun challenge. Thanks for coordinating. Great job on this Lisa--Try as I might I was not happy with what I did for it--but LOVE what I'm seeing for those that did. Love how you just took one striking element from it and then based your card on it.